Tête à Tête with BelleBarcelone #4: none other than the celebrity chef Jordi Cruz! The section "Tête à Tête with BelleBarcelone" has had a good response with all of you and what better way to end the summer section with none other than Barcelona's young, good looking and restless chef Jordi Cruz. I had the pleasure to spend some time with him in the beautiful garden of the Abac Hotel. So what is behind this celebrity chef? Just a pretty face? The fame from television? I don't think so. I came to know of someone who loves what he is doing, passionate about food, sure of himself and great at what he does. Unlike what I had heard he is friendly and down to earth. I have tried some of his dishes, and I can assure you he knows what he is doing. Great dishes, superbly served with a young and chic "je ne sais quoi". During our chat he inspired confidence, freshness, innovation and perseverance. 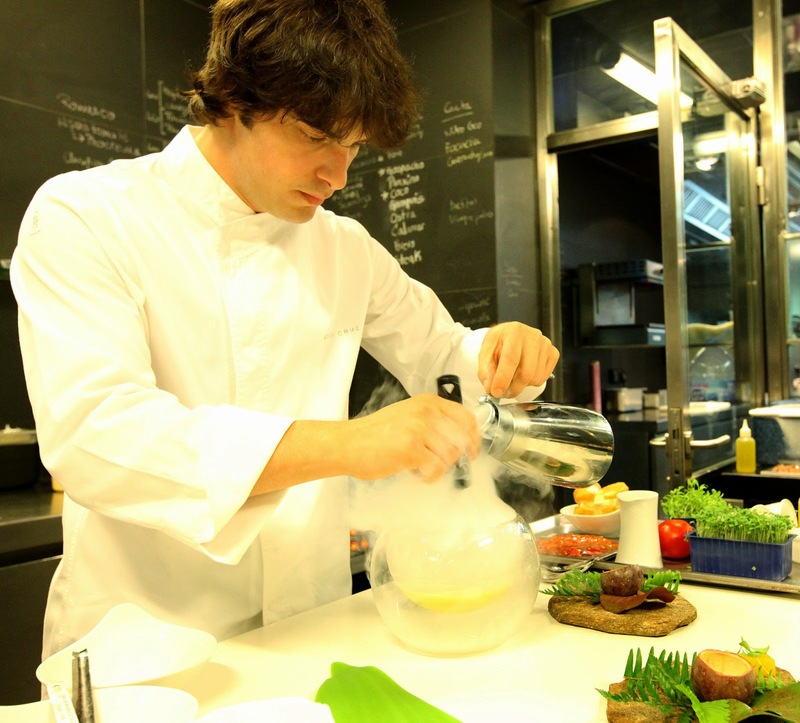 BelleBarcelone (BB): What is your style of cooking? Jordi Cruz (JC): Tradition and avant-garde, both at the same time. BB: What sets you apart? JC: I don't want to be labeled. I like to use all the techniques, to create and innovate with the ingredients I have. BB: What are the secrets behind a successful restaurant? JC: The restaurant has to have a special soul created by the chef's passion. BB: What dish would you choose if you had 3 ingredients? JC: Depending on the season and what ingredients would be available at that time. All the ingredients have their own charm and soul. One thing for sure salt would be there. BB: What kind of ingredients do you use? JC: I use all kind of ingredients from all over the world. I buy my products from the local farmers. I worked for many years in Mont Sant Benet (Angle used to be situated there previously) and got to know many local farmers, so I still get most of my products from them. I also get them from all over the world as for example some special Mexican pepper or Thailandes keffir leaves. BB: What are the pro and cons of being a TV celebrity? JC: I will just keep the pros. Abac has 50 seatings in the main hall, those are the people that come,eat, enjoy and will talk about it. Since I am on TV, there are 5 million people who have come to know me better. I do get a bigger clientèle from all over Spain nowadays. It has been a great experience. I am still the same person, those moments of success can't get into your head. BB: Where do you like hanging out? JC: I love going and trying other chef's restaurants. I love disconnecting while admiring the view of Barcelona on top of the mountain. BB: Where do you go for holidays? JC: I haven't had a holiday since 3 and half years. I love cities with history. BB: Which chef do you admire? JC: Pedro Subijana, Ferran Adria, Michel Bras, among others. When I was a child I was in awe of all the big chefs we have in our country, I would have never imagine that they would be my friends one day. Just that day Pedro Subijana had dinner here, and when he praised the dishes he just had; I felt so happy and proud; those are the most valuable recompenses. BB: Which cuisine inspire you? JC: All of them. I use all different touches in my cuisine based on catalan dishes. Just that day a client wanted to know if the chef was Japanese! BB: I have read somewhere that Noma, the best restaurant in the world, was soon becoming a vegetarian restaurant. What do you think? JC: I feel the restaurant gets too restricted. When i look at a beautiful prawn, it talks to me. I need to experiment. I can also tell you that I respect vegetarianism, and I could prepare you a beautiful curry just now in 15 minutes. I am sure you will like it and I will use what I have in my fridge right now.At Abac we have many vegetarian dishes and many dishes that we could adapt too. So being a vegetarian doesn't prevent to come here and enjoy! BB: What would be for you The Special meal you would like for a very special day? JC: I would like to be surrounded by my friends, almost all of them are in the gastronomy sector. It would be a very simple meal. I would just need the sea, beautiful scenery in a creek, some boats and simple and beautiful seafood we could all roast and enjoy together. The chef at work at Angle. Labels: Chatting with BelleBarcelone!, Interviews, Somewhere special!